Hotels would reduce their dependence on OTAs and would have the perfect partner if they were to offer exclusive prices on their website. Meta search sites would have the only channel different to the rest (there are many OTAs but only one official website), which in many cases offers the best price. To be a price-comparison website without having the best price would be a failure. 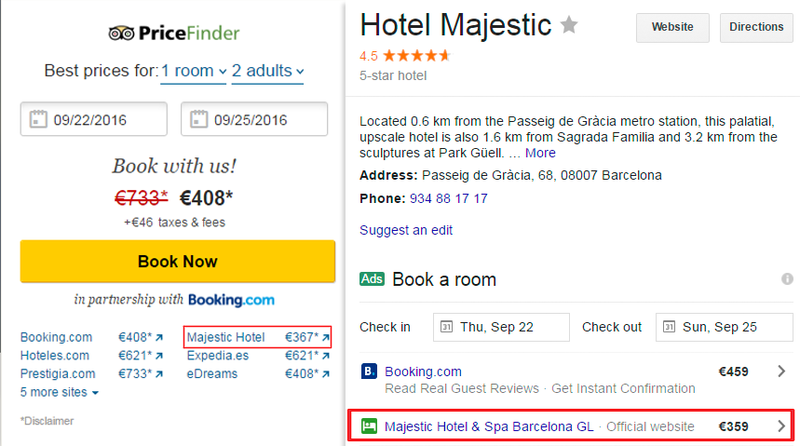 This lack of understanding between hotel and meta search sites paves the way for OTA sales, especially for Booking.com, the undisputed king of this industry in Europe, who always wants to be in the top spot at no matter what price. The other big loser is the final client, who shall have to expressly google the hotel’s official website in order to find its price. Cost. Price-comparison sites look to capitalise on each click and tend to treat hotels (chains and independent ones) like if they were OTAs, with high rates that make it hard to make a profit from these investments. Slowness in registering process. Many hotels find it hard to register, especially chains. Lack of service, slowness in the reply, technical problems in the registering process or high demands are just a few examples as to why. Daily management – lack of tools. Once everything is “connected”, every hotelier has to manage these investments, which he cannot afford. Increase or decrease the bids? Which markets to be in? Which budget should be set every month per market? All of these questions are posed by the hotel, which increases an already heavy daily workload. Mistrust. Hotels are tired of paying more every year to sell the same in the direct sales. They see price-comparison sites as a threat rather than an opportunity. It’s obvious that it’s not pleasant to pay to have a presence in them but, if they don’t do so directly, they will do it anyway with the commissions paid to OTAs. The technology that connects with the price-comparison sites exists, is affordable and tested (in other words, it’s not a technological challenge). The hotel doesn’t have investment problems (in other words, it’s usually not because the hotel doesn’t want to invest). Real direct sale. An essential subject for hotels, who want the transaction to finish on their website, which used to be the traditional model for price-comparison website. However, there are new models where the client finishes his booking on the price-comparison website (TripAdvisor Instant Booking is today the most popular one, although Kayak released theirs a few years ago). There are great expectations with Google and their product Book on Google (BoG), which also runs along these lines. Hotels are suspicious of this sale because Instant Booking is not a direct sale . If they participate, they do so defensively (in order for the OTA not to get the sale, thus reducing costs). However, hotels must think in what clients want and adapt accordingly even if they don’t like it. Clients want simple and integrated booking processes (especially on mobile phones), hence the appearance of Instant Booking and similar systems.As a hotel, you can abstain from participating in models that are not real direct sales. However, you must be alert as to whether meta search sites are giving more importance to the sales model on their websites than to the one that they redirect to the hotel website (a legitimate move on their behalf if, this way, you win more clients and money). o Risk. Commission per effective booking (after cancellations) does not imply a risk for the hotel. Costs shall always be under control. o Liquidity. The hotel pays after the stay (and payment) by the client at the hotel. o Understandable. Hotels are used to paying out commissions. Many owners or managers accept a commission model without hesitation. However, they will question CPC models and find many problems with them. Google Hotel Ads (GHA) and TripAdvisor’s Instant Booking are the only ones of the four big ones that currently offer CPA. Note: For many hotels (those of average price and medium-high stays), it’s probable that the CPC model is more interesting than CPA. Calculations need to be made. Profitability. Hotels have a specific number in their heads which is the 18-20% that they pay out to Booking.com for their bookings. Any investment that is a higher equivalent commission shall be questioned.In CPC models, the hotel must calculate the “equivalent commission” (investment/generated production). To this number they must add the partner cost derived from integration (many companies charge an amount for this “connection”), plus the commission of their direct-sales technology (search engine).The following must result after the sum of all of these costs or otherwise the hotel will raise doubts: Conclusion: many of them shy away from it and don’t participate. Those committed to a CPA model start at elevated commissions (minimum 12% on Instant Booking and 10% on GHA), leaving little profit margin (however, a profit is still generated). Price-comparison sites should reflect on and analyse the increase of hotels they would have if they reduced the costs as well as the quality of an exclusive channel such as the direct one. Results order from lowest to highest.The one thing that frustrates hotels a lot is not understanding the order of results. 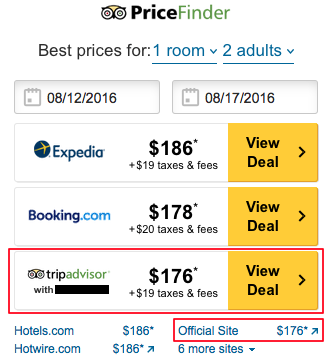 This makes them think negatively about price-comparison sites and come up with conspiracies (real or not) that these sites benefit OTAs (let’s not forget that Trivago is owned by Expedia Group the same way Priceline owns Kayak). Does this result make sense? It probably does for TripAdvisor and Google, but it generates the hotel frustration and distrust. An interesting debate. 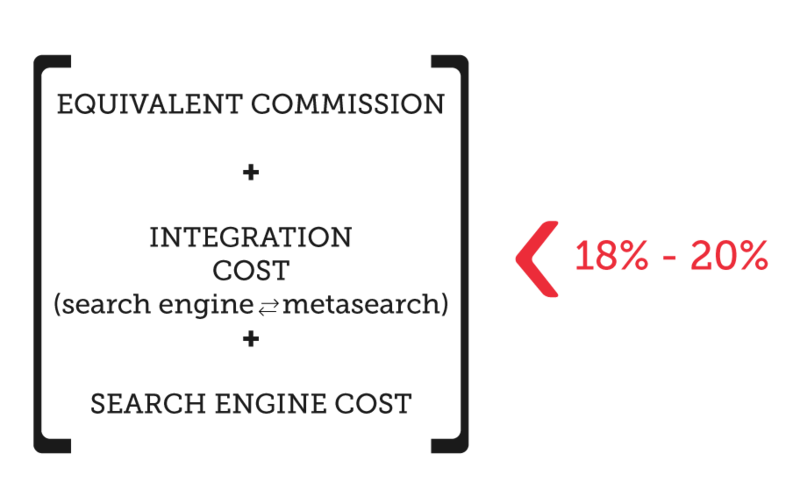 Does the client really understand a metasearch result where the cheapest option is kind of hidden? We assume many tests have been done, although we still find it quite surprising to see these results. Easy management. Only a minority of hotels and chains (including the big ones) are able to manage investment in price-comparison sites. The rest doesn’t have the staff numbers, the time nor the will to do it. Conclusion: if you leave the management of this investment in the hands of the hotel, the hotel will get tired of it and give up after a few months. A control panel is essential, since it will be able to manage many hotels at the same time and it will be controlled by specialised external companies. Google is the best example of this, since it allows to manage hundreds of hotels from a single panel. Also, it has recently allowed a hotel chain or an independent hotel to manage their hotel directly from a centralised account (Google Sub Accounts). Automatic booking reconciliation. For CPA models, the hotel has the need to contact all the different price-comparison sites and “reconcile” bookings (in other words, communicate the cancelled ones, no-shows and modified ones) so that they are not charged a commission. This exercise is yet another task for the hotel, whose time is already stretched and for which any barrier is yet another impediment to participate. The price-comparison site must offer the option of making this task automatic and to be synchronised when the booking is marked as cancelled on its engine. TripAdvisor is the only one that offers this service in its Instant Booking. Sales volume. This means views and more views. Once we have the perfect price-comparison site, we will need one more thing, albeit the most important one: views, many views. Today, Trivago is the king of views in Europe, whereas TripAdvisor is the king in the UK and the USA. Google is starting to grow considerably but it’s still not close. 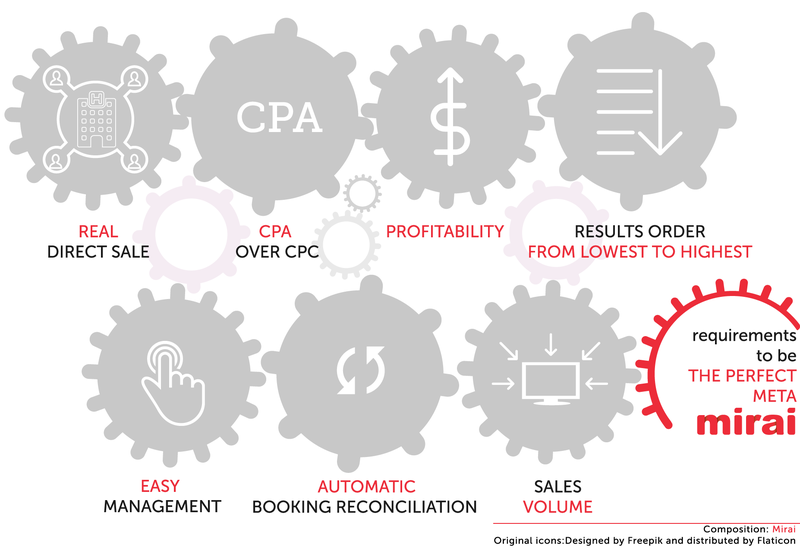 If we had to summarise it in one sentence, we would say that the perfect price-comparison site would be the one that offers a CPA model of maximum 10%, orders results in a transparent way, shows real direct sale, has millions of daily views and has a centralised management panel with individual access to accounts and an automatic system of booking changes. The lack of understanding between price-comparison websites and hotels is paving the way for OTAs, who, without offering any value to the hotel, are channelling bookings at a high cost and with no opposition from the hotel. If a few months ago we stated that 15% of Booking.com’s sales come from Adwords by your name, have you thought about how much OTAs sell by connecting to metasearch engines? The result would most definitely be surprising. The first meta to change his strategy and achieve that all hotels connect their direct sale and offer their best price on his site, will win over the clients in the long term. A great reward that is still awaiting the winner. The PCI-DSS regulation is coming to hotels… Are you ready?